Go back almost two years, while we all secretly enjoyed Truecaller, we were skeptical of using it. The fear of leaving your phonebook exposed was overriding the curiosity of knowing the unknown caller. This fear made sure that as much as we liked what Truecaller offered, we were not the most vocal about the service because we would not fit well with the crowd protesting the importance of online privacy and security. Once it became clear that Truecaller was safe and adoption became more mainstream, you could not imagine how life was the same before. As long as you were in an area with some internet connectivity, Truecaller made sure that you were at least not bothered by the regular annoying calls from the operators or insurance distributors when you just bought your pre-paid SIM card four days ago and your insurance premium is already a headache to pay off. Fast forward to today and not just Truecaller, the Scandinavian startup has two new applications up its arsenal called TrueMessenger and TrueDialer. 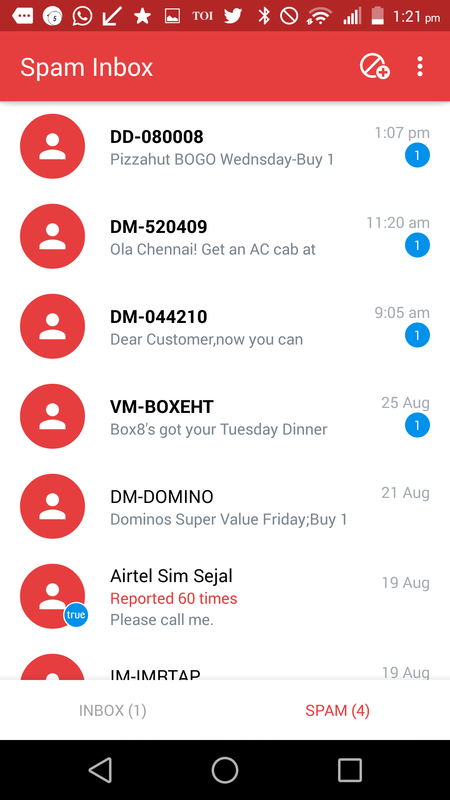 While the former simply filters your messages based on your contact, putting anything that you do not have in your contact list in a spam folder, if marked, while recognizing the contact, the latter helps in recognizing the unknown number from the Truecaller database mostly ensuring your call history never has a number without a name to it. One glance to the dock on my OnePlus One, and you see the three Truecaller apps with the camera application there. Essentially TrueCaller has replaced my stock dialler, messaging application and added a utility app that helps recognize unknown callers, the three things that are basic functions of a smartphone. While the noise around the whole privacy issue was loud, it is worth noting that the noise we heard was mainly from those who make noise in the tech world, that is mainly the bloggers and tech journalists. The general public’s opinion on the issue was far more subdued and as long as nobody was stealing off their money or invading into their conversations, they were very relaxed about the situation. A clear case of something being blown off the proportions simply because the media wanted to make a story out of it. Yes, it is scary that someone could be seeing your data, but at least with Truecaller, we do know that the apps really use only your phonebook. Everybody understands and appreciates that if you want to know the identity of a number, you must contribute to the ecosystem as a whole and having a mega directory is after all not such a bad idea. The curiosity of unknown today is much more than the fear of sharing your number simply because today’s world runs and functions on the wires of telephone. You never know which call or caller could bring the opportunity that would change your life. The cost of that opportunity is so high that the definition of privacy has dramatically changed. It is no longer as thick and hard bound as it was once upon a time. Put TrueCaller, TrueMessenger and TrueDialer on your dock and fire them up one after the other, say after opening Gmail and you will feel all of them are a part of the same family. While TrueCaller does not strictly follow every guideline of Material Design, all three apps are close by in terms of UI. They are modern looking and have enough traits of material design to make them all look well integrated with the modern Material Design language that Google has followed since Android 5.0 and above. Once you have used TrueMessenger for example, using the other two applications is not that big a jump and therefore you have that sense of familiarity. The fact that TrueDialer comes with Dark Theme is an added advantage if you like dialing at night as it prevents unnecessary blast of white light in a situation where there is already a dearth of some. We may be doing absolutely nothing all day, and we are okay with that, but that one call from a tele operator is enough to send our BP shooting up. We feel it is some sort of crime that somebody stole away our one second of absolutely nothing and that is not fair. Even an SMS by a Pizza company for a discounted pizza is frowned upon because we feel that in today’s age of information we are perfectly capable of searching for one rather than being neck held towards it. We are okay looking for the same pizza deal and using the coupon code, but would not want that SMS in our inbox. An SMS takes literally Kbs of space on our phones, but just because we have no time for spam but for everything else, it makes all the sense to have something like TrueMessenger that would sort out and keep you away from the spam. One situation where I thought TrueMessenger was a major boon was when my Telecom operator started sending me a Text Message after every call alerting how much credit I saved because I had subscribed to one of the special recharge options. Post every call, the same text would appear and that really bothered me, clearly being spammed, I decided to mark the sender spam, and over 100 such messages are rotting away in the spam folder and I do not have to bother. Apple sort of brought what TrueCaller does in its native dialer on iOS 9 recognizing unknown callers, Google did a part of it on Android 4.4, while Xiaomi also introduced a spam folder in the messaging app on the MIUI 7. Two of the largest OEMs out there recognize the importance of not having anything unknown on your device and have taken a leaf out of the book of TrueCaller. While we have not tested the MIUI 7 implementation, the recognition definitely doesn’t work with the Beta iOS 9 that I am using. It will take a while for the OEMs to come up with solutions as robust as TrueCaller simply because their product today has a larger database and it will take time for say the Apple community or the Mi community to come to the paces. There’s a good chance others may never get as accurate as TrueCaller because they’ll be restricted to only showing numbers of publicly listed businesses. Till then, the best you can use is the TrueCaller apps and given how well it sits with the rest of the material design apps, we see no hurry to switch to OEM based solutions at least on Android. All Apps just work, so why would you not utilize them? The best thing about the three replacement apps is that they work pretty much flawlessly without eating or hogging up the resources. Yes, there are issues with certain OEMs where the apps close down in the background memory but I was told that the the TrueCaller team is actively working with these OEMs to solve the issue where the app will be whitelisted from being shut in the background. We did not experience any force closes in our time with the three apps and they do everything that the default apps would have done and more without hogging any substantially extra resources. When the feature is present and there is nothing to lose out on, we see no reason why you would not utilise them. Above are the reasons why TrueCaller apps have become True replacement for the stock apps on my Android device and quickly are becoming among the top five apps that I would recommend on any new Android device. Do you share the same opinion? We would love to hear from you. This article is contributed to WebTrickz by Arpit. A lover of everything metallic that flies, he spends most of his time on his desk working in the marketing team at Pricebaba. He is currently using an iPhone 6 Plus and a OnePlus One as his daily drivers which are just as likely to change as the Mumbai weather.